How many teams can see their ace carry a no-hitter into the 8th and still create a handful of controversies out of it? Firstly, the question about pulling CC Sabathia out of the game at the end of the inning whether he had the no-hitter going or not, was academic. It assumes that with his rising pitch count, Sabathia was going to throw 10 to 25 more pitches without losing enough on them to give up a hit (which obviously he did anyway). Secondly, why on earth did Joe Girardi say anything about it – it had already happened and all he could possibly do was deflate Sabathia after a thrilling day and great game. Thirdly, no, Joe Buck and Tim McCarver did not cause Sabathia to lose the no-hitter by saying the word “no-hitter” 224 times. I have a tape of the famous 1969 Tom Seaver game where he lost a perfect game in the ninth courtesy an obscure Cubs’ utilityman named Jimmy Qualls. The Mets’ radio announcers meticulously avoided ever saying “no-hitter” – and he still lost it. Remember my speculation last week that there was something wrong with the baseballs? The covers were too slick, or the stitches too high, or something that was causing pitchers and fielders to have trouble with gripping it, and led to them sailing it, sometimes as hilariously as Carlos Zambrano? Garrett Mock of the Nationals complained about it Friday night, and Mets’ scout Bob Melvin mentioned to me yesterday that he’d seen and heard about it too. This must be taken in context. Years ago, Mr. Scoggins thought it would be really hilarious to invite me to host the annual Boston baseball writers’ dinner – without telling me that I was going to have to personally present an award to another baseball figure with whom I was having a very public feud (who, me?). This was a variation of the original plan in which I was to merely introduce whoever was to present the award. I found out as we all walked out to the dais. “Surprise!,” Scoggins said to me (conveniently the other figure skipped, possibly because he’d found out I was presenting). So, in short, Mr. Scoggins does not have an adult sense of humor. Thought this might be a treat. Three seldom-seen items from the collection, pertaining to the soon-to-retire skipper of the Braves, dating from the opposite end of his career. In fact, they all are from a time before I knew Bob. We met in Spring Training of 1978 – if you can believe that – when I was the most fledgling reporter imaginable, and he gave me a very cordial and respectful interview even though I was, in short, a moron. 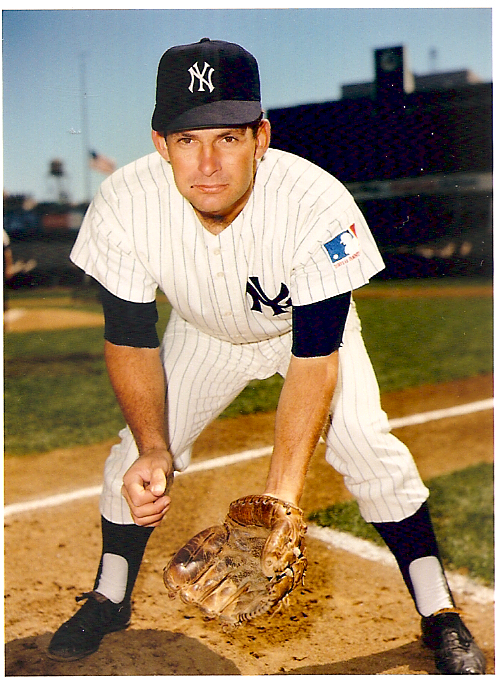 This first image is from his two-year career in the Yankee infield, as the starting third baseman for much of 1968, and then as a utility guy in 1969. 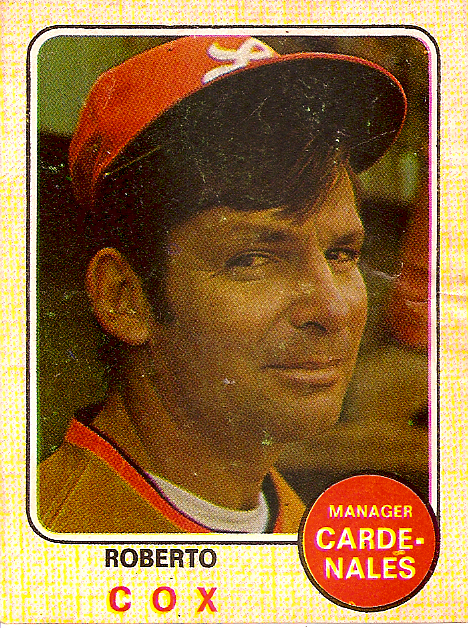 It’s an unused photo from the files of the Topps Company and is theirs, please, with copyright and everything. He’s younger, but you can see he already looks like the manager he was to become. 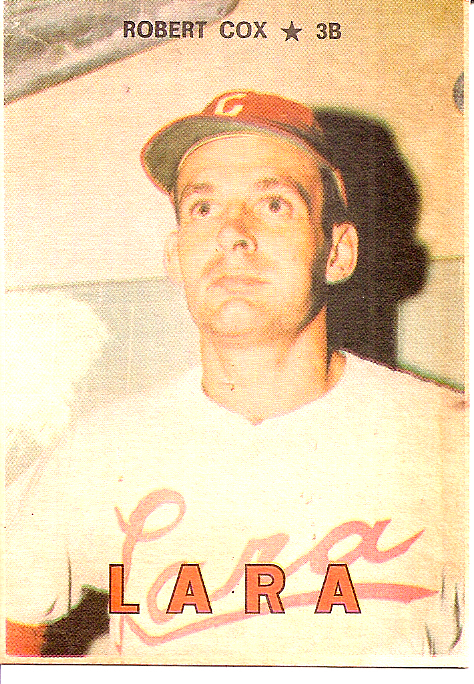 Below is a card from a beautiful set from Venezuela and the once dominant winter league there, in 1967-68. Kind of formal with the third baseman’s first name. 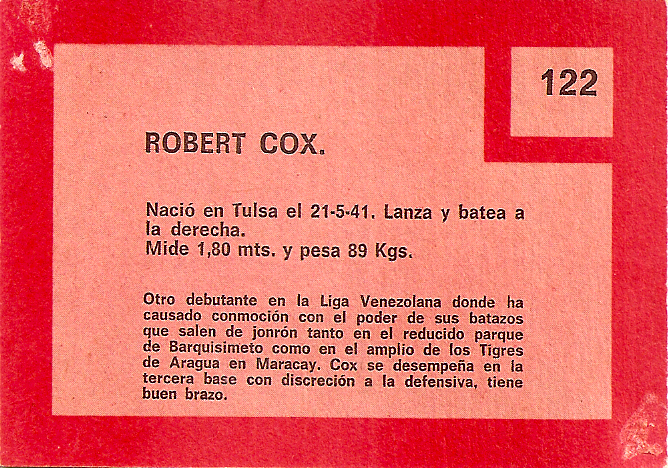 Coxy’s ascent to management was far more rapid in Venezuela than the U.S. By the winter of 1974-75, the card of Mr. Cox of the Lara Cardenales showed him as the manager. Maybe more importantly, it showed him as…Roberto?